Sorry for the absence folks. I had to go and pay a visit to my good friends at the Mayo Clinic in Rochester last week. It was not an emergency or anything serious. Just some tests and diagnostics that my health care providers cannot give up here. All is well and I was very happy to get back home late on Wednesday. Somehow time got away from me yesterday and I also ran out of steam by the evening, so delayed the writing until today. So, I am sure I do not need to tell anyone living in the Midwest about the turn of events in the weather pattern that has opened up the flood gates to the arctic, but for those not living here, the entire Midwest has been subjected to two strong arctic air outbreaks in the past week. Temps as low as -28 have been seen as far south as southern WI and there have been temps in the -30’s in the traditional cold spots of northern MN, WI and the southern UP. Our temps have been modified by the still largely open Lake Superior and have been managing to rise above the zero degree mark most days for highs and have seen lows mostly in the single digits and low teens. However, last night, the winds were light and from the south and skies briefly cleared and that allowed the cold air from the south to sludge into our neck of the woods and temps bottomed out at around -20 at midnight and then began to warm and were in the single digits below zero by sunrise. Currently it is a balmy 11 above. It may seem like I am joking when I say a balmy 11 above, but I just spent around 15 minutes outside with the dogs, letting them play and it actually seemed much warmer than 11 above! I actually had my gloves off for much of the time and my hands did not even get cold. I do know that our bodies can acclimate to the weather conditions to some degree, but was pretty surprised to feel the way I did when out in the cold this afternoon. The third and final arctic air surge will spill into the region tomorrow and Wednesday looks to be brutally cold in much of the Midwest. Temps of 35 to 40 below will be seen in the Red River Valley along the MN/ND border and -20’s look to occur all the way into southern IA and northern IL. The big lake will help us out and keep us from getting much colder than -10. Although some pretty strong north winds look to create wind chills of -35 to -40 from later tomorrow through Wednesday and Wednesday night. The cold has been bringing us lots of lake effect snow as well. 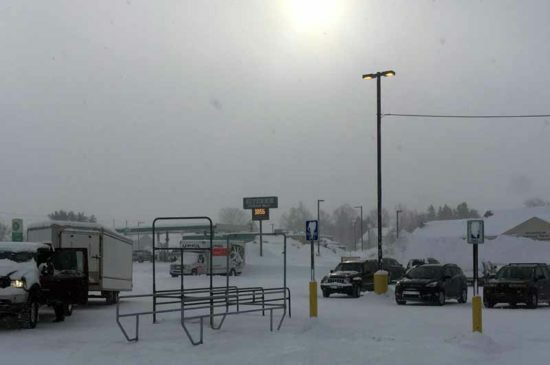 Sine last Tuesday, we have seen 26″ of snow fall. Some areas more and a few considerably more! 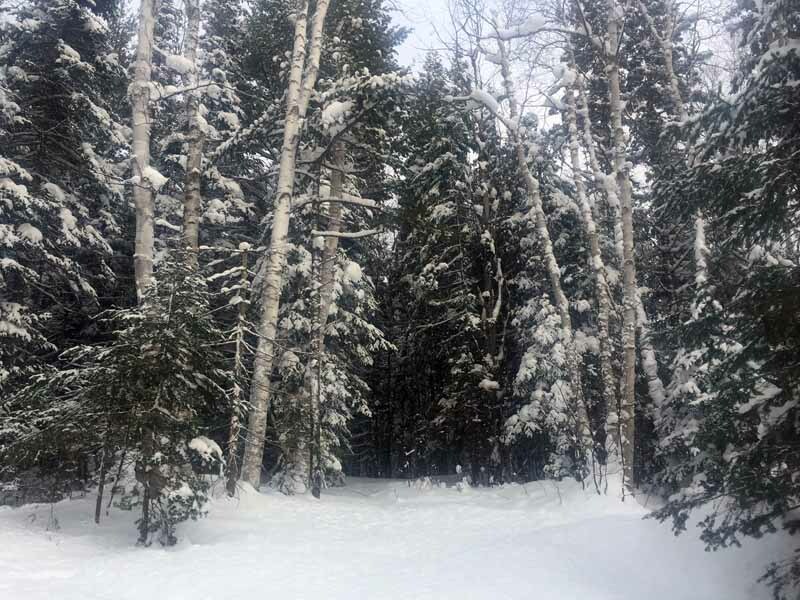 It finally looks like winter in the Keweenaw up here! 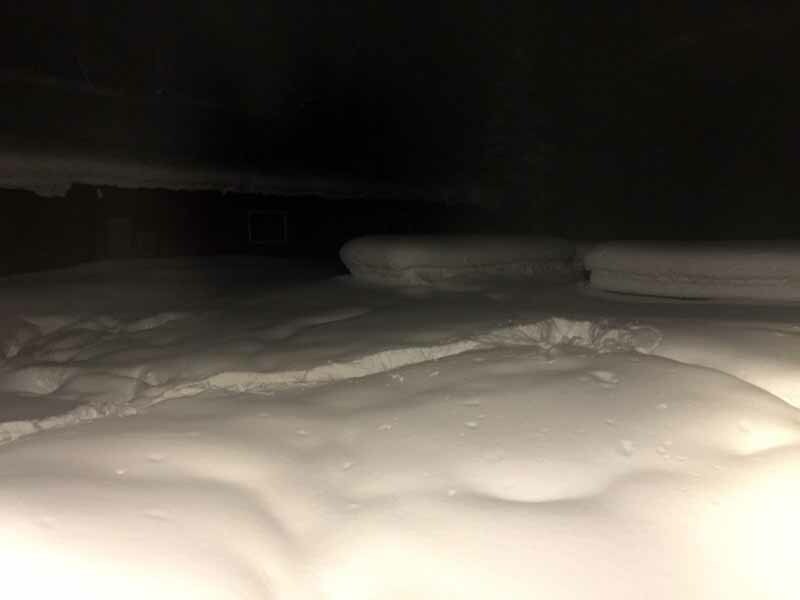 The snow on the roof is deep enough that it will be getting removed soon (not by me!). 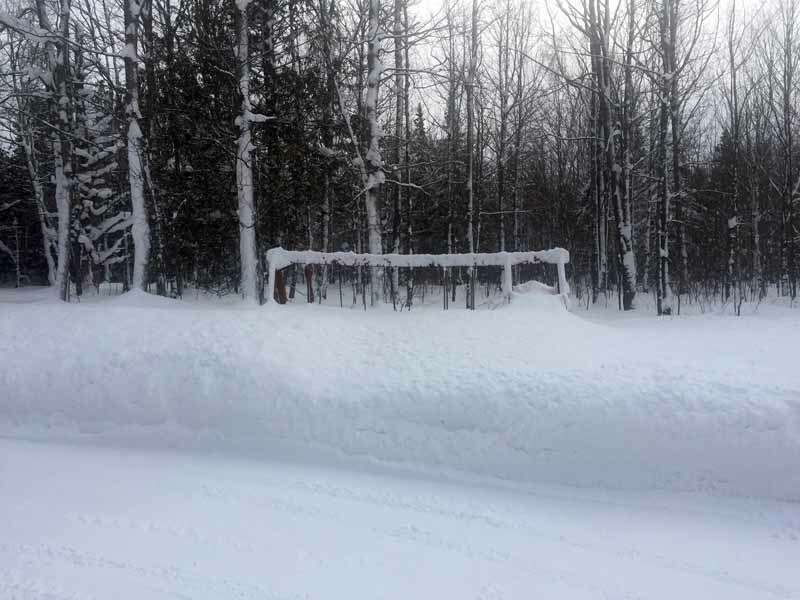 The swing set is about 75% buried in the snow and the trees have a nice flocking, despite some strong winds at times. 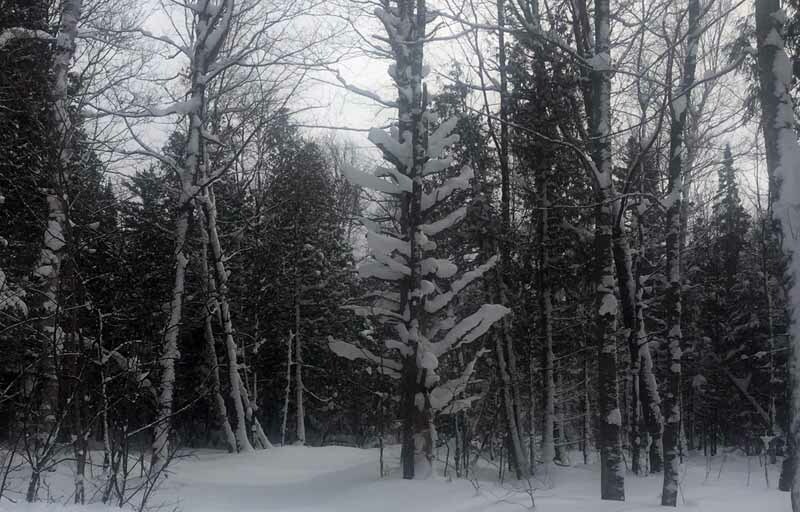 The ones I love are the old white pine that have died and have only bare trunks and some rotted stumps for branches. They dress up well in the snow! 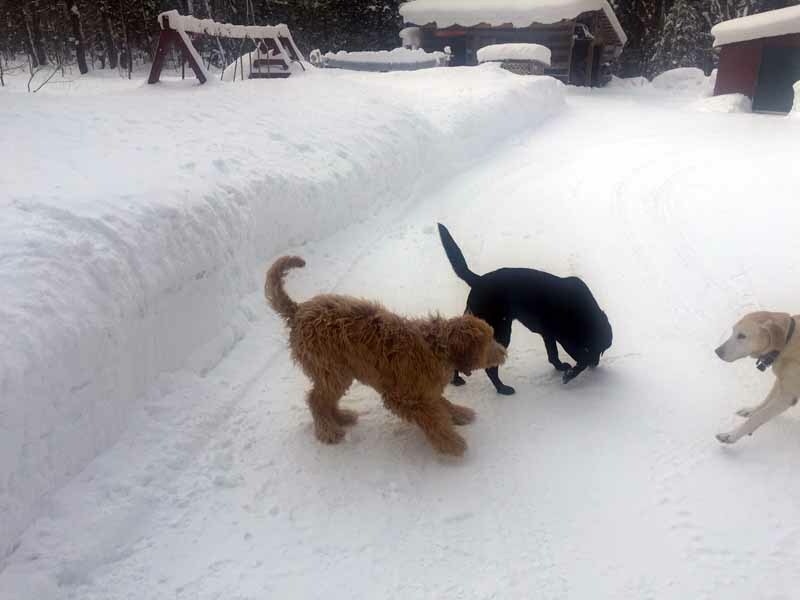 The deep snow has presented it’s challenges to the dogs when it comes time to do their business. Huck and Millie are well seasoned and do not even seem phased in the bit and Bleau has caught on very nicely as well. Still, it is kind of fun to watch them bunny hop in slow motion through snow that is up to their backs and even deeper sometimes, just to go potty. I did respect the privacy of the dogs and did not take any action shots, but here it the trench left by one of them. I do feel sorry for them on the really cold days, as they cannot spend much time outdoors and this really gives the puppy, Bleau, a case of cabin fever. Huck and Millie are old enough to be OK just laying around the house on the warm floors. So this afternoons short little romp was a lot of fun for all of them and after dinner I think Nora, Grace and I will take them all out to play and get rid of as much puppy energy as possible, as it looks like most of tomorrow, all of Wednesday and most of Thursday will be too cold to spend much time outside. We do look to warm up very nicely by the weekend. I am very happy for that. Not just because I do not enjoy the bitter cold, but because the Keweenaw Snowmobile Club will be holding it’s second annual trail side bonfire and cookout. Last year was pretty chilly, but this Saturday it looks like the temps will be topping out in the upper 20’s! We could even have a bit of light snow falling, just to add to the atmosphere. If you are up here this weekend, please stop by! We will have pulled pork, hot dogs and hamburgers, as well as coffee, hot chocolate, water and soda. All free, although there will be some donation buckets there as well. The event starts at 11 am and ends at 3 pm. It is being held at the Trailside Lodge in Calumet. It is right off the trail, so getting there by sled is easy as pie. If you prefer, you can also arrive by vehicle and park in their parking lot. I will be there the whole time, as well other club members. We will also have the youth sled that is being raffled off as a fund raiser this spring and hope to have one of our groomers there for a while, so folks can get a close up look, or even perhaps climb in the cab and see what the view is like from inside a 1/4 million dollar groomer! The only other news I have to share is that trail 133 will remain closed for the season due to logging. We were hoping to be able to get a re-route done, but that did not pan out. On the up-side. 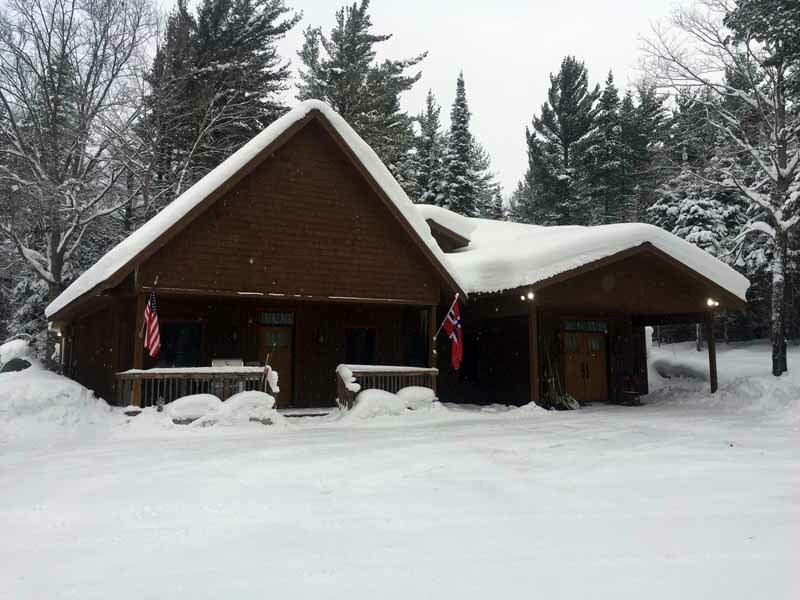 The Valley Snowdrifters Snowmobile Club has BOTH of their trails open from the Dreamland Motel to trail 122 (Lake Linden to Gay). So folks wanting to take the road less traveled and not have to take the upper trail from Hancock to Calumet have an alternative. You can either pick up their trails off of 122 or can take trail 3 from Hancock to Dollar Bay and then jump on their trail in Dollar Bay and take it to Dreamland. It really is a neat trail, basically a single or 1.5 sled wide trail for most of the way and the traveling is much slower and more intimate with the surroundings than many of the main trails up here. The Valley Snowdrifters are actively grooming their trails as well. They have an enclosed SxS that pulls a drag. There has been an injection of new blood into their club and this has had the effect of bringing some new persons into the grooming operations. So the guys that have been doing it for 20+ years are getting a bit of relief while the new blood is stepping in.